Released: February 2013. Genre: FPS. 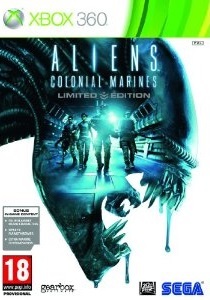 As we enter what could be the final year of the seventh-gen consoles, 2013 finally sees Aliens: Colonial Marines hit store shelves, a game which has lingered around in development hell for most of this generation. The oft-delayed shooter has had Alien fans clamouring for a release since its announcement back in 2006, promising an interesting bridge between Aliens and Alien3. Gearbox has also established themselves as a reliable developer as their duo of Borderlands games were met with critical and commercial success. One would expect A:CM to be of a similar such quality, but as stories of a hellacious development and tensions between SEGA and Gearbox arise, one thing is clear: Colonial Marines ends up disappointingly poor. Perhaps the greatest facet of A:CM is how it captures some of the spirit of the film series, such as the opening moment where Winter loads his Pulse Rifle. The sound design contributes to this greatly. Every weapon taken from the film – especially the Pulse Rifle – sounds exactly like their movie-screen counterparts, every screech from the Xenos is just as spine-chilling and the music offers a good reinterpretation of what we were treated to with the film scores. Unfortunately, the dialogue doesn’t do quite as good a job at achieving the same level of charm as the film. The grunts who accompany you have little personality; I had forgotten the name of one character merely a day after playing. One moment where two characters awkwardly exchange “good talk” highlights the lacklustre dialogue. And get ready to hear “ooo-rah” more times than bearable. This contributes to a middling plot, which feels both underwhelming and nonsensical at times. You take the role of Sgt. Winter who is part of Rhino 2-1 Actual. After opening with a distress signal from Aliens hero Corporal Hicks, squad leader Cruz details how the Sulaco has reappeared in LV-426’s orbit. Cruz has already sent a squad to investigate, but they have failed to report back. So, Winter and his group follow suit and try not only to find the missing marines but also investigate just what is killing off Cruz’s soldiers. There’s certainly plenty for fans to find – mostly Easter eggs and other hidden references – but A:CM pales in comparison to the engaging yarn spun in Aliens, whilst a late game appearance of a character presumed dead consequently disrupts the entire canon. More damning, however, is that A:CM feels like a shooter rooted in the past. It features some of the most notably rigidly-structured and unimaginative shooting in recent memory, though admittedly the mechanics at least function. While you can scour for hidden goodies to a point, most of the game is like a linear corridor, with occasional instances of spacious gunfights. Moments where you don the Smartgun are fun, but these are a rarity. What’s worse is that the Xenomorphs have been curbed to the point of resembling household pets. They attack you with very little speed, aggression or intimidation, removing almost all of the tension that was such so synonymous with the films. This also makes the game ridiculously easy: even on the hardest difficulty, you’ll find yourself having more trouble with Weyland-Yutani soldiers than the iconic creatures, and that’s just wrong. Though tougher, the soldier A.I. isn’t much better, often lingering out in the open. It’s a shame that the combat is so devoid of tension, as some interesting systems tie the game together. Playing single-player levels up your Marine, and each rank adds a Gear Upgrade. All of the Primary Weapons can be customised with upgrades such as silencers, laser sights and even paint jobs. It’s a little limited in comparison to games like Army of Two, but it’s still a nice feature to have. Finding collectibles is more worthwhile than usual because not only do they add insight to the story, they also reward XP which can help boost your character quickly. These systems can only go so far to extending the replay value though, as Colonial Marines clocks in at little over six hours. It’s a really short game, though the harder difficulties do add a little more challenge. Co-op is available too, but is extremely dated. Co-op characters are not acknowledged, you can’t drop in or drop out without having to restart the mission and the tight corridors highlight this game was not built for co-op, which is exacerbated by the inclusion of friendly fire. Multiplayer is little more than a rip off of Left 4 Dead. It pits the Marines against Xenos in all modes, and four game-types are in place. Along with standard deathmatch; Escape tasks the marines to flee a level while fighting off Xenos, Survive asks the marines to hold out as long as possible and Extermination serves as the capture-the-base mode. The main problem is that the two races feel unbalanced, particularly during deathmatch modes. It’s easy for a group of marines to pick a spot and camp while the Xeno team have zero way to penetrate their defences, meaning the marines can scoop up easy victories. The game forces you to swap each half, but it means playing as the Xenos can be somewhat frustrating. This is worsened by the fact Marines can bring their upgraded weaponry from the campaign into the multiplayer, leaving Xenos at a major disadvantage. Generic much? I'm sure no one will come to harm, so don't worry readers! Perhaps the crudest aspect of A:CM is its visuals. Some appeal, at least, lies in the recreation of Hadley’s Hope and the Sulaco, which feel authentic, and the Xenos look pretty spot-on. However, everything else feels like a throwback to 2006. There’s a laundry list of problems: textures are flat and pixelated, animation is stiff, the frame-rate can’t keep steady in intense situations, lighting is just completely flat and frequent glitches such as stretching corpses occur. Weirdly, cut-scenes seem a lot better, featuring improved texturing and significantly improved lighting, but that’s hardly compensation. It’s amazing to think that seven years was spent on this game, only for it to come out looking seven years-old and completely out of its time in 2013. A dark stain on Gearbox and SEGA’s catalogue, Aliens: Colonial Marines is a disappointing game. Long stuck in development hell, it feels more like a game that was scrapped together in time for a big movie release. The visuals are awful, gameplay feels dated and the story feels disconnected from its source material. Some may find some old-school appeal in the game’s simplistic approach, but it mostly becomes repetitive long before the brief campaign is over. The XP and weapon systems are interesting but not enough to extend lifespan, while the derivative multiplayer modes are frustrating due to the lack of balance between Xenos and Marines. It certainly feels like an Aliens game, but it’s not enough to raise Colonial Marines above mediocrity.